Samsung has unveiled its all-new 2017 television range at CES. The QLED series – Q9, Q8, and Q7 – will replace the two-year-old SUHD line as the company’s flagship TV offerings. They feature a better picture quality and new design features, including Chromecast-like functionality. Samsung claims it achieved another world first with the QLED TV range, in that they are capable of representing “100 percent color volume,” meaning they can show all colors at any level of brightness. The TVs also have better viewing angles and brighter high dynamic range, with peak luminance as high as 1,500 to 2,000 nits. But it’s the design features of the new QLED series that may get the most attention. Samsung’s proprietary ‘No-gap wall-mount’ system lets owners affix the TVs flush against a wall. For those who prefer stands, Samsung is offering an easel-style ‘Studio Stand’ or a ‘Gravity Stand,’ the latter of which resembles a contemporary sculpture when attached to the television. Anyone who uses a wall-mounted setup may find that the various cables leading from the TV can look unsightly, but Samsung has got around this problem with its Invisible Connection cable. All peripheral devices can be linked to a box that sends signals to the QLED TV via the cable, which is almost as thin as a strand of fishing wire and uses fiber optic technology. Finally, there’s the Chromecast-style functionality, which lets anyone with access to Samsung’s Smart Hub and Smart View app beam content from live TV shows and streaming providers directly from their phones or tablets to the TVs. 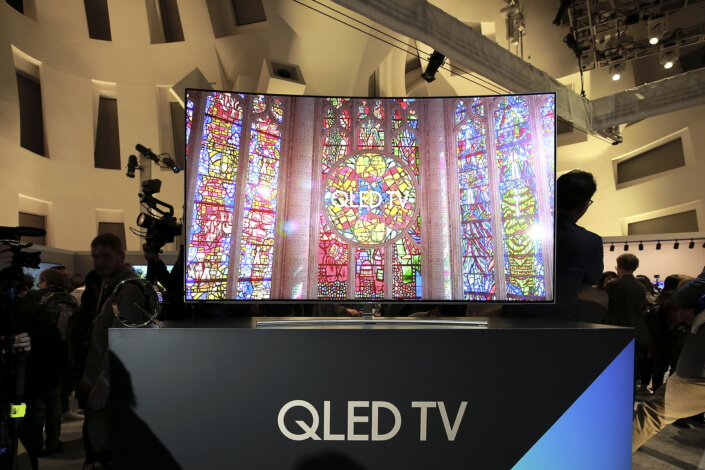 The QLED range will also feature Samsung’s three updated Smart TV services, which offer personalized Sports, Music, and TV programming to viewers. Samsung showed off the 65-inch versions of the Curved Q8 and Flat Q9 just before the start of CES. No word yet on when the QLED line will be released or how much the sets will cost.